Cody Willoughby | AIM Media Midwest Harold Hughes, of Troy, reacts to the unveiling of the new Harold N. Hughes Court on Saturday at Lincoln Community Center. The facility’s basketball court underwent an extensive floor renovation throughout the month of March, and was dedicated in Hughes’ name to honor his 30 years of service to the center. Harold Hughes, of Troy, reacts to the unveiling of the new Harold N. Hughes Court on Saturday at Lincoln Community Center. The facility’s basketball court underwent an extensive floor renovation throughout the month of March, and was dedicated in Hughes’ name to honor his 30 years of service to the center. 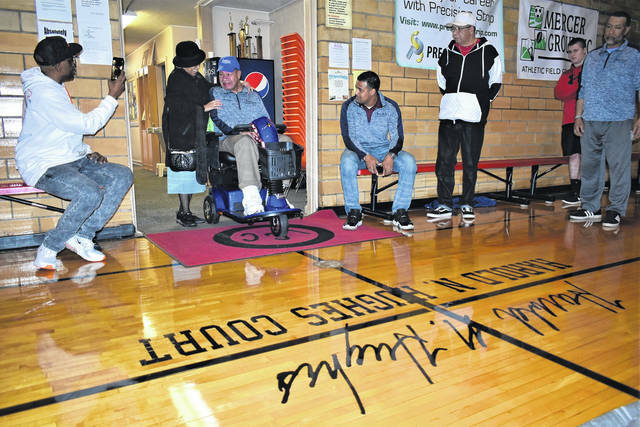 https://www.tdn-net.com/wp-content/uploads/sites/21/2019/04/web1_LCCCourt1.jpgCody Willoughby | AIM Media Midwest Harold Hughes, of Troy, reacts to the unveiling of the new Harold N. Hughes Court on Saturday at Lincoln Community Center. The facility’s basketball court underwent an extensive floor renovation throughout the month of March, and was dedicated in Hughes’ name to honor his 30 years of service to the center.